Mother’s Day is coming up quick next month. 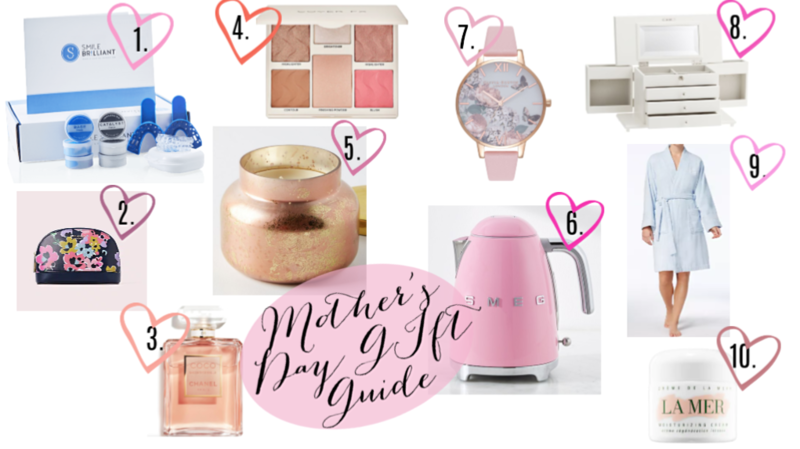 I put together this guide for all of you who want to treat your mom to something great ( she deserves it,) without spending a ton of money! 1. Smile brilliant teeth whitening kit: My mom and I have actually been using this kit for a while now and we love it! It’s super easy to use and you get the same results you would from the dentist right at home! *There’s also a chance to win one of these whitening kits. Click here to enter! 2. Floral makeup bag: Love this print and how cute and dainty the bag is. It’s perfect for travel and a great gift! 3. Chanel perfume: A classic and timeless scent. Any mom would love this perfume. 4. Cover FX face palette: I love the tones in this and it comes with a variety of products that are super versatile. 5. Anthropologie Candle: I actually gifted this to my mom for xmas and she’s obsessed with it. It not only smells amazing but the jar it’s in is to die for. 6. Retro electric kettle: This is SO cute!! It’s one of those things you don’t want to buy on your own but would love to have, making it a perfect gift. It also comes in an array of pretty colors. 7. Floral watch: I love the soft color and pattern of this watch. It’s super feminine. 8. Jewelry box: This is such a great gift and goes with any bedroom or beauty room. 9. Fur robe: I always like to add a robe onto all of my girl gift guides because it truly is such a good gift that lasts a long time. You can never have enough comfy robes. 10. La Mer moisturizer: I love this product. It’s great for everyday and makes your skin feel silky smooth.